If you work with Oracle Database as Newbie. Perhaps you're just thinking you need to work with Oracle Database product. You're curious about Oracle Database 11g: SQL Fundamentals I, Because SQL concepts and SQL commands are important. So, You should take Oracle course. 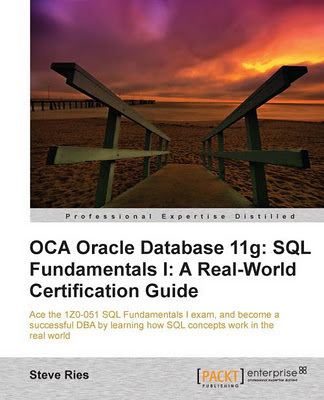 Anyway, You are just looking some books which was wrriten about Oracle Database 11g: SQL Fundamentals I. I'd recommend "OCA Oracle Database 11g: SQL Fundamentals I: A Real World Certification Guide" book. Written by Steve Ries(blog). This book covers 12 chapters. Readers're supposed to learn about SQL concepts and etc... You will start with SQL Developer installation. Why you are supposed to know about SQL Developer (Because, you should have some tool/program to connect Oracle Database). You will learn about SQL (SELECT statement, DML, Functions to manipulate data). You will learn from Examples from the real-world(including Example by Pictures), that helps you easy-understand . When you finished each chapter, You will see "Test your knowledge". I believe that is helpful, Because It'll improve your comprehension. However, I think this book is good for readers as Oracle Newbie. When I open it each of pages, I mean page by page. I saw examples and example pictures., That helped me feel easy while I was reading it. Thanks for the nice review of my book. Thank You for a good book. I absolutely believe your book is useful.